Bob: The opening scenes to this episode are my idea of heaven… idling away a sunny afternoon beneath rustling tree branches and – splendidly – neither Compo, Clegg nor Foggy have any idea which day of the week it is. Foggy – of course – bristles at this (‘We ought not to be just sitting here in the sunlight’) but it feels to me like a pretty damn fine way to live. Again, we see the closeness between Clegg and Compo, and I can’t help but see them as a kind of senior, Yorkshire version of Tom Sawyer and Huckleberry Finn… substitute the River Holme for the Mississippi and you’re just about there. Although I’m not sure where Foggy comes into proceedings. Joe Harper, perhaps? Or even Injun Joe? Andrew: The way in which they struggle to remember what day it is takes me back to those long summer holidays during primary school. They seemed to stretch on forever and, just like Foggy, we were lost at sea without a timetable. In fact, since I still work in a school and still get most of the summer holidays off, I continue to find myself in the same predicament! Anyone know which college Foggy’s scarf belongs to? We need to know! 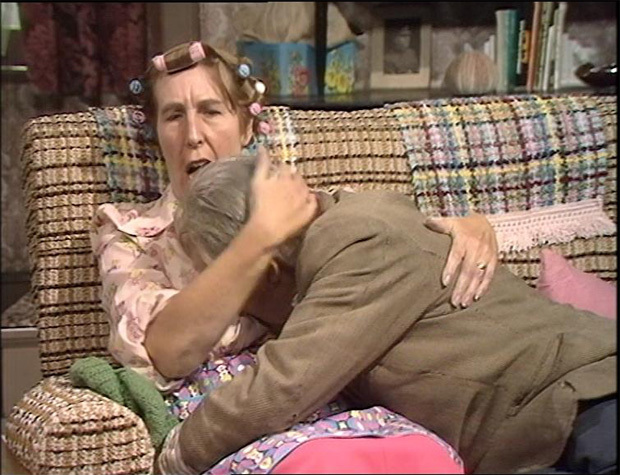 Bob: Meanwhile, back at the café, there’s a pepper spillage and suddenly Compo, with tears streaming down his face, finds himself being comforted within the ample bosom of Nora Batty. I’m sure I’ve read that Kathy Staff used to repeatedly request that Roy Clarke write more tender scenes for Nora, as she didn’t want the character to come over as a complete battleaxe… there had to be some compassion there to make the character believable. And here we see it in droves… it’s a lovely performance from Kathy, as Nora takes Compo into her front parlour (the very thought!) and continues to console the conniving little twerp. Andrew: It’s clear to me now that Roy Clarke must have something of an attraction towards a comforting bosom (don’t we all?). 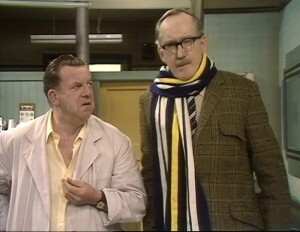 Nora’s particular brand of sympathy foreshadows the similarly – ahem – ample comforts that Nurse Gladys Emmanuel would offer Granville in Open All Hours. Bob: It’s nice to see that Nora clearly does have a certain tenderness towards Compo. If she genuinely hated him, as seems to be the case on the surface, then the relationship just wouldn’t work onscreen. Nora would long since have moved away, or taken out a court order, or had him battered by some intimidating nephew or other. We need occasional respites like this just to justify the fact that they tolerate each others’ existence for so many decades. And, just for a few seconds, Compo is clearly transported right back to that mysterious VE Night encounter! I’ve just noticed in this episode that the café has been decorated as well! In the first series the filthy walls are clearly visible… the one behind the counter, in particular, is absolutely black with mould and long-ingrained damp. It’s a really grotty little place. Now, though, it’s covered in clean, fresh wallpaper! Clearly done by Sid under duress while Ivy bellowed from the kitchen. And now she she’s got him installing a temperamental buzzer on the café door… hence the ‘Sidney’s Wire’ of the title. A strange thought struck me when I saw that title… do Sid and Ivy ever reveal their surname? Andrew: You know, I don’t think they do! That’s quite strange when you consider how often the characters are referred to by their second names; whether it’s Mrs Batty as opposed to Nora, or the derogatory ‘’Symonite!‘ , levelled at Compo. 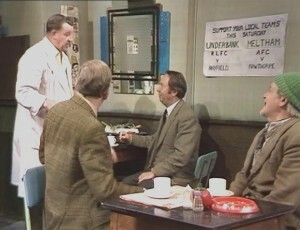 Bob: I actually spent far too much of this episode trying to decipher the posters on the café wall. 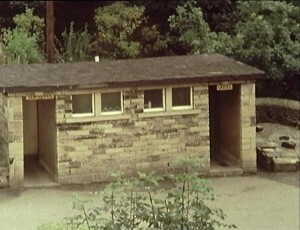 There’s an advert for ‘Underbank RLFC vs Mayfield’ – both still functioning Rugby League sides, with Underbank being based in Holmfirth itself. And, next to it, advance notice of ‘Meltham AFC vs Rawthorpe’. Proper football this time, and although Meltham AFC are still going strong (they’re a non-league side, also based in Holmfirth), I can’t find any trace of a Rawthorpe FC still existing. Anyone else want to have a go? A nice touch, though – especially as, I assume, the café scenes were filmed in a studio at TV Centre? So presumably someone brought a load of local nick-nacks down from the location filming in Holmfirth, and used them to decorate the studio set? That’s attention to detail, that is. Some would call it love. Andrew: Maybe we should return the favour, design a huge Summer Wine banner, and go cheer on the next Underbank home game? I’m sure we could turn Ronnie Hazlehurst’s theme into a chant. Bob: The tender scenes with Nora have clearly put Compo in a romantic mood, as there’s a nice wistful scene towards the end of this episode, where Compo reclines against a back alley and ruminates upon his former romantic glories. ‘I used to do a bit of courting round here, with Mary Daggles. Forty years ago… I wonder if she still thinks about me?’ he ponders. Andrew: Yep, this is the sort of scene that makes the series for me, so far. Clarke’s little character moments act as a nice contrast to his increasingly knockabout plotlines, but they’re not overly sentimental. They’re very grounded and personal and… well, Yorkshire, I guess. Bob: It’s beautifully played by Bill Owen, and – again – it’s Clegg alone that is the recipient of this more thoughtful side of Compo. He never seems to open up like this in Foggy’s presence. I occasionally find myself thinking about youthful scrapes that happened – to my horror – over thirty years ago, and the depiction of similarly melancholy angst in this scene is pitched perfectly. Andrew: I have to highlight the closing scene as well. Just one sustained shot of a public convenience, with our heroes chatting away from the inside in voiceover. It’s also nice to know that toilet wall graffiti hasn’t changed a bit in the forty years since this was made. ‘I used to do a bit of courting round here, with Mary Daggles. Forty years ago… I wonder if she still thinks about me?’. That little scene, which doesn’t have any plot function, rather sums up the series for me. A lovely, character driven scene. Getting On Sidney’s Wire, has my favourite visual gags in the early series as Sid walks along the plank and it bends so he’s basically on the floor with Foggy (sitting on one end) lifted up. I don’t really think the Cafe looks that much cleaner than before though….It’s true it’s a little bit cleaner, but it’s still pretty grotty (look at those vending machines!). It’s series 6 (Bicycle Made for Three) when it get’s it’s full paint and makeover. Oh…and I don’t think Sid and Ivy’s surname is ever revealed…Mind, it took 26 years for Howard and Pearls surname to be revealed on the show (it was first in one of the novels, but wasn’t used till the final series). That line of compo’s wondering what they’ll put on his gravestone, takes on something extra if you know that they filmed that in the very graveyard that Bill Owen is now buried. It’s quite a fun beginning-middle-end episode with interludes inbetween Sid’s doomed mission. I do agree with Foggy that sorting the wire out first would have been a more sensible idea, but wrapping it around salt pots (let alone pepper pots) is a daft plan. Foggy means well, but then, as Spike Milligan put it, so did Hitler. At least the pay-off when Ivy returns is worth it. I too have watched the eps often enough to wonder about the likes of Underbank (hell of a name). The weird scene with Nora seems solely to re-establish her and Compo above the others, yet Clegg and Foggy’s stilted polite observers bit is far better. That final scene is something else. What other shows could pull off (!) a static shot of a convenience exterior and make it work just on the voice-over dialogue?